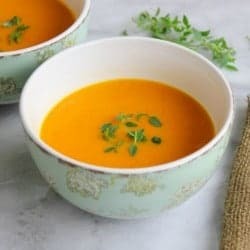 This recipe is barely a recipe at all in the fact that it is so easy to make and so versatile! It’s a dinner I make all the time that my family loves. 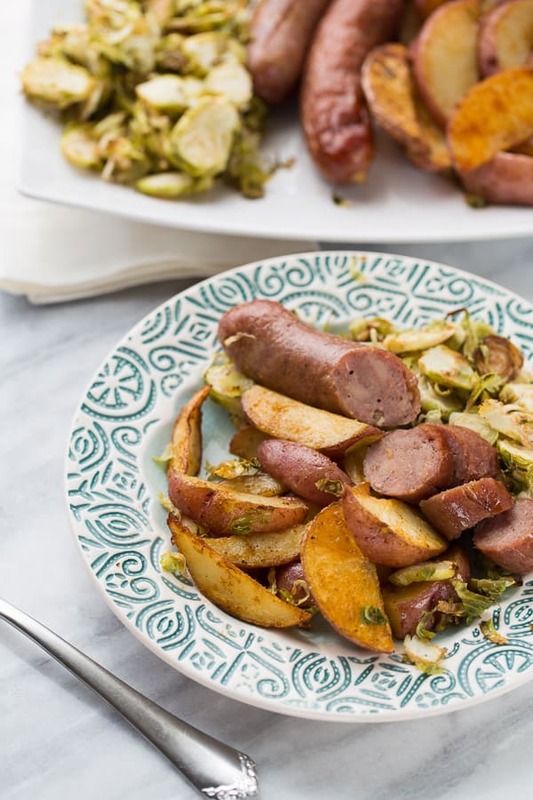 The potatoes are flavorful and slightly crispy, while the brussel sprouts get a lemony zing. I’ve decided shaved brussel sprouts are where it’s at when it comes to brussel sprouts. I love buying fully cooked sausages from Costco or Trader Joe’s and having them on hand for when I need to make a quick dinner. 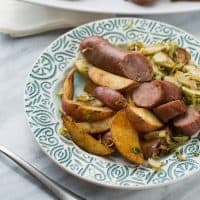 My favorite flavor for this recipe is Aidells Pineapple Bacon Sausage, but any fully cooked sausage will work! 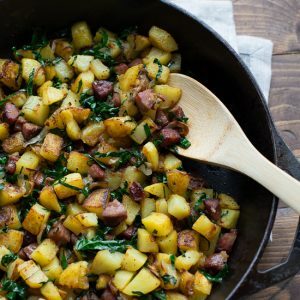 I also love fully cooked sausages in this Carmelized Shallot, Kale & Sausage Hash. This dinner is all made on one sheet pan which means no clean up on busy nights. The leftovers are also fabulous if you cut up the sausage small and serve it with eggs of any kind for breakfast. 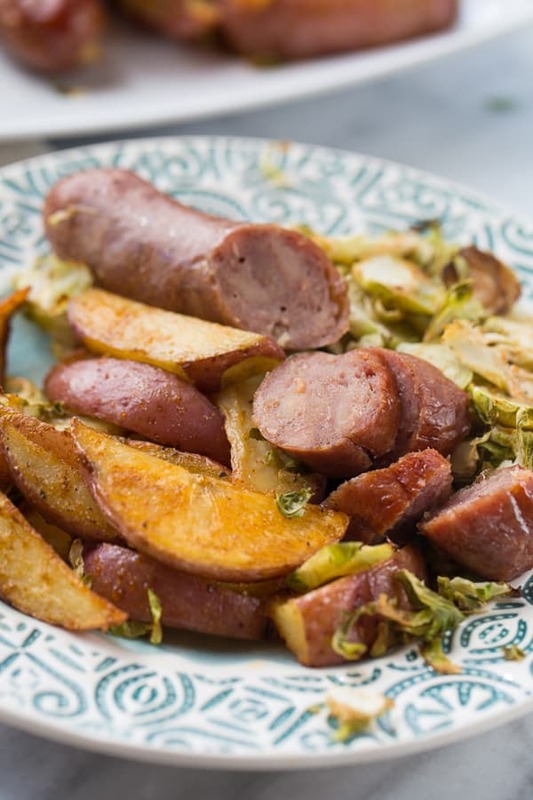 Potatoes, sausages and brussel sprouts taste so comforting this time of year. This is a meal I know my kids will always eat and love! My favorite sausages to use in this recipe are Aidellls Pineapple Bacon Sausages. However, this recipe will work great with any sausage you like! Preheat the oven to 400F. Place the potatoes on a baking sheet and sprinkle with the olive oil, salt & spices. Toss to evenly combine then spread into an even layer on 2/3 of the baking sheet. 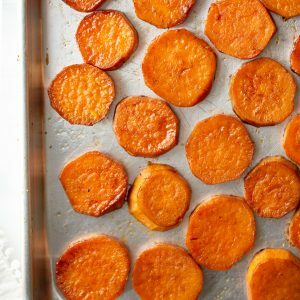 Bake the potatoes for 20 minutes. After 20 minutes, remove the sheet from the oven and flip the potatoes. Place the brussel sprouts on the remaining 1/3 of the baking sheet and sprinkle with the olive oil, lemon juice, salt and cayenne. Toss to evenly combine. Place the sausages on top of the vegetables. Bake everything for another 20-25 minutes, stirring the brussel sprouts often. Serve and enjoy! That Brussels sprouts looks good! Love this hearty combination! Perfect for fall! This looks SO good! And minimal clean up? I’m in! I loved the potatoes but my brussels were seriously burnt. I will make this again but adjust the cooking times.